Wow, it seems like ages since I posted last. The last time I paddled before today, was last Monday! Last Monday was a bumpy ride, but today was perfect! I didn’t get out on the water until almost 9:30 a.m. but the conditions were so perfect, I decided to head straight down to the boat ramp. Down at the boat ramp it was pretty quiet, only one little boat hanging around. The turtles have been so scarce lately, so I didn’t even bring my iPhone for pictures. It figures that I would have a great turtle day when I left my phone behind! Fourteen turtles at the boat ramp! I sat between two sets of two; one turtle floated right up to my board and bumped into me! Turtles were popping up all over the place! I was so happy to be surrounded by turtles again. It was so nice at the boat ramp that I didn’t want to leave! The conditions could not have been more perfect. I paddled back in nice conditions and ran into a paddling friend outside of Kam 2. She told me that it had been windy when she started out earlier in the morning….. so I guess I got very lucky with the conditions! Just as we were sitting there chatting, a big turtle surfaced by us…..that made the number of turtles for the day fifteen! 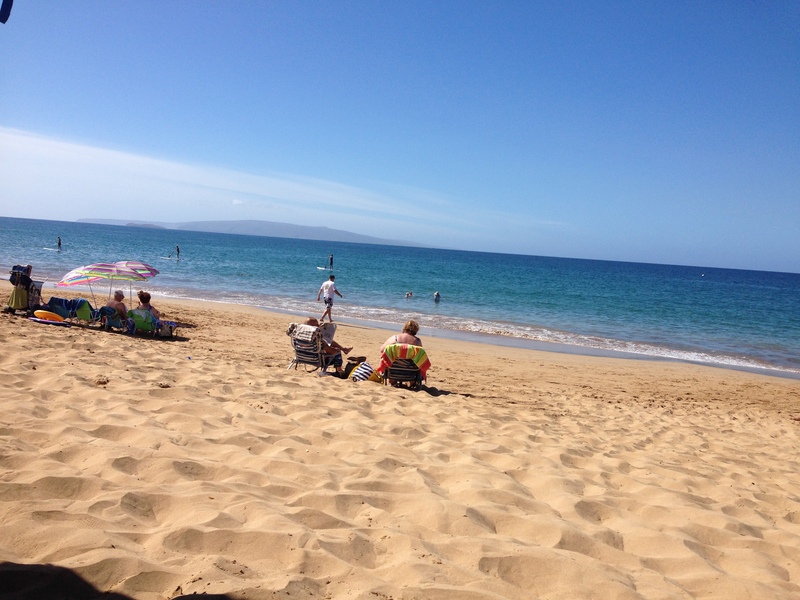 My swim was just as perfect and it was very hard to leave the beach because it was so perfect still! I could use a few more consecutive days like today!